The story of a campaign to combat childhood obesity starts with a roller coaster ride. Kinkaid High School rising senior Bradlee Few has a friend who cannot ride the ride because the safety bar won’t latch over his large frame. She uses the story in her video to drive home an issue of epidemic proportions. According to Bradlee, there are 6.5 million children in the U.S. who are overweight. That is three times the population of Houston, she says. Her compelling video called “Tipping the Scale” is well researched and includes some impressive interviews. Moreover, the video is backed up with a plan of action through the website http://www.shouldieatthisorthat.org. After volunteering with Recipe for Success, a Houston nonprofit dedicated to combating childhood obesity, Bradlee launched her own plan of action to advocate against childhood obesity. She is well aware of the psychological impacts of childhood obesity after interviewing her high school counselor Laura Lomax-Bream, who has practical experience with the matter. “My original goal in making Tipping the Scale was to inspire individuals to take action against the spread of childhood obesity,” said Bradlee Few. “That goal has largely maintained, but I have added to it with the goal of providing step-by-step ways to get involved. These advocacy methods and information about childhood obesity are available on the website, http://www.shouldieatthisorthat.org, which I created in conjunction with Tipping the Scale to further the reach of the film’s message. 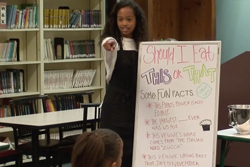 We are amazed that a teen has taken on the cause of childhood obesity and is actually issuing a call-to-action to her peers and adults. She drives home the importance by calling attention to the statistic that 45.7 percent of Texas children are obese or overweight. Take a look at the video and join the movement this summer. We’re interested in hearing how educators are addressing childhood obesity. Harris County Department of Education’s Communications and Public Information team helps promote the efforts of HCDE’s programs and services to the education community. Our close-knit, award-winning team works together on creative strategies to effectively support the organization. We’re always looking to share great stories and on occasion contribute to the HCDE blog, School Bell.